Not long ago I finished up to season 7 of the Doc Martin series. Season 8 has yet to be released. I want to own that series someday. I could watch it over and over. It really makes me feel happy for some reason. I think it is because it is a rather poor community of people who care for each other in all ways. Martin is the rich ‘outsider’ who comes into the play of things because of his own frailties; he has a phobia of blood for one thing and is forced out of his passion and extreme competence as a surgeon. He has to face his ‘failures’. The character Dr. Martin Ellingham is a brilliant man who has issues with expressing positive emotions. At a point, he and his wife Louisa seek professional help for their relationship. In an answer to the therapist, Martin says, “I think happiness is overrated.” He would like to ‘make’ Louisa happy, but he doesn’t think it is necessary for himself. As the story unfolds it is revealed that Martin had suffered an emotionally deprived childhood. He wasn’t wanted by his mother and his father was self-involved. I love his character. Even in the depths of emotional isolation, he struggles to turn his unsuppressible love for Louisa into a good thing; he sees the errors of his parents ways and realizes he doesn’t want to be that way himself. A big key to unraveling what genuine happiness is seems to be self-discovery and not hiding from truths. A permanent feature on the bottom of each blog post on this website is my all time favorite quote about success. This seems to be where happiness resides for me. When I feel that I have met a challenge and not shirked from it, I feel a real sense of happiness. My career in design was often grueling. It required tedious attention to detail if I didn’t want to run into trouble and even then, my own efforts were no guarantee because there were so very many others involved in the process. It meant constant attention to ‘relationships’, constant thinking, and exhausting work, both mental and physical. But, I remember one specific job that was especially grueling and at the same time exhilarating. A woman wanted a bank of woven wood shades on a string of windows on the street-facing side of her house. There were so many little issues, I can’t even begin to explain it. The shades themselves had all kinds of details that had to be properly considered; where brackets can be placed, valances over the brackets, how far above, how close together between blinds, the gaps that would exist…and then there were the windows themselves with no two measurements alike. Well, it was an unbelievable amount of focus on detail and required mathematical gymnastics that I felt forced to attend because my livelihood and reputation fell on that focus. The job went in without one single solitary hitch. I felt probably the same way a rock star feels after an especially successful concert. I felt as high as a kite. Driving home required a trek along a long stretch of downward sloping highway. Well, in my stupor-high from self-satisfaction, (happiness), my foot got heavy and a cop’s light went on behind me. Somewhere in the conversation he asked me where I was coming from and what I did for a living, (my car was filled with samples). When I explained that I had just come from working with a client as an Interior Designer his face lit up. His daughter wanted to pursue that path. I further explained how utterly high I was feeling from the ‘success’ of the job that had just been completed. He was the nicest cop I have ever experienced. He gave me a chance to explain. He gave me a warning and let me go. Part of why I think I wanted to remove myself from that career was because I had had relative success and I wasn’t interested anymore in going through those grueling episodes for money. Money has NEVER been the ultimate motivation in anything I have done. It has always been about pursuing my own truth, feeling free, and knowing that I was seeking truth in all things related to that freedom. I do think though that I have gone a little too far in a direction I need to turn back from, isolation. I feel a need to reengage with ‘society’ again. 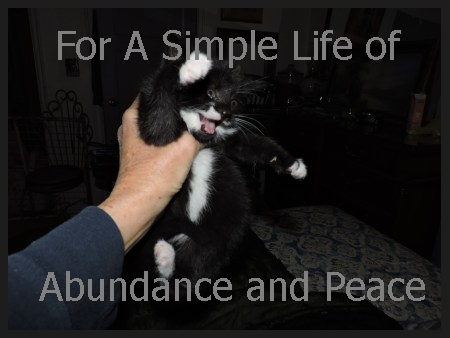 That is what I will be working on to improve on the happiness I already have in this life of #VoluntaryRadicalSimplicity. Even in this radical simplicity, there are needs and no one can kid themselves that it can be done without some form of ‘money’/ exchange. This is where the new goal comes in, Spare Shelf, (an old business idea that needs to be exhausted), and why I am determined to get this old house in a less than hovel condition. …It does seem, in this climate of deregulation and the stripping away of our social safety nets, that it might be a good idea to find a way to invest our own personal labor in a way that it is not constantly being stripped away from us with lower wages, fewer or more expensive benefits and no hope for upward mobility or even finding a job that can sustain us. In this author’s opinion, the best hope for doing that is creating businesses for ourselves. So, the new, New Deal is that we are in this together. We need to find ways to benefit each other while meeting our own needs. Spare Shelf is about building a business model that will give others a place to build a business. Finally painting the ugly concrete floors. Primer first. Thinking of some kind of #TravelingSoiree where local people interested in teaming up to help promote each other can hold Coffee Klatch kinds of gatherings in my house or others, kind of on a Tupperware model. Staging things so that I can live with them while I pursue this goal. What I’d love to do at this stage is find an old tear-drop camper to refurbish and ‘dwell’ in and make the house available as a venue for the Spare Shelf ideas. Doing the fun part first is sometime necessary to get the ball rolling. The carpet tack holes were not done first as they probably should have been, but I would likely never have started if I had waited to do them. I’m so HAPPY that I have finally tackled this truth; the floors were the main ugly. This is just a primer. The ultimate goal is to do a special paint pattern in layers and coat with a durable clear finish. The idea I am playing with is to start the Spare Shelf concept with a Traveling Soiree of sorts. an evening party or gathering, typically in a private house, for conversation or music. The goal is to make the house a place where this #TravelingSoiree idea can start. Hopefully it will evolve to be classes, events, and general sharing and caring. T-Shirt yarn crocheted baskets and heart-shaped pillows made from scraps and fabric samples. …Research shows that happiness is not the result of bouncing from one joy to the next; achieving happiness typically involves times of considerable discomfort. Money is important to happiness, but only to a certain point. Money buys freedom from worry about the basics in life—housing, food, clothing. “Meaning and deep satisfaction” involves getting outside of self. Hopefully I can be what I need to be to make this change. It’s not about the money. It’s about feeling a deeper sense of value in the world. One that isn’t focused on negative things, but in making better things happen.